What is it that stops you in your tracks? Having a deep rooted fear can play havoc with your everyday life. It may mean avoiding certain situations or places. In turn this may mean that you miss out on fun things. Or bigger, more serious things. It is to be held on the 20th floor and means getting in a lift. Confined spaces freak you out and so you can't go. You've missed out on a great opportunity because of your fear. Being in a crowded space sends you into a hot sweat. You have to avoid that at all costs. The love of your life could be in that room but you're never going to meet them because you can't go in. It means flying to the Bahamas. You can't go because you can't face getting on a plane. Is there a way out of the cage of your fear? This may be a tricky one to do alone as you may not know the source of the fear. For example you may know that clowns trigger fear in you but I don't believe that will be the source of the fear. If you do know the source, think about why the fear is still there. Do you still 'need ' it? This will be the start of your journey. 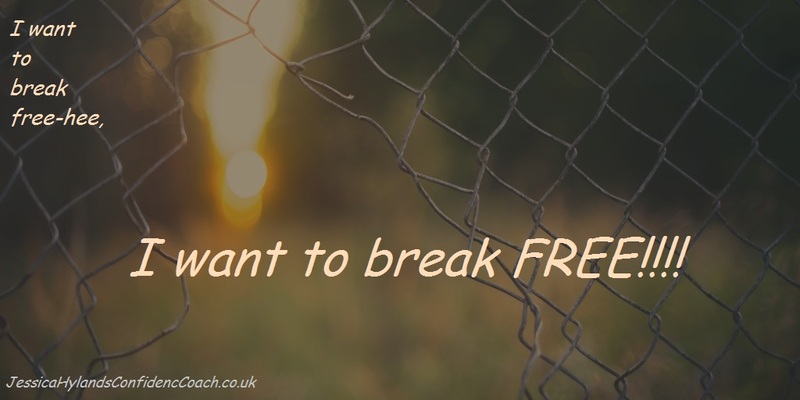 If you have a fear and want the freedom to live life without it, do get in touch for a chat. I wonder whether you have a fear of something? If you do, you may know where this fear has come from, or may assume that you know. For example I used to be petrified of dogs. So scared that if one was on a lead I still had to cross the road. I assumed that at some time in my childhood I’d been frightened by a dog which had left me with this massively sensitive ‘awareness of them’. This fear had so many effects on my life. You might think ‘Well just avoid the park where people walk their dogs’ or ‘So just cross the road when you see one – it’s no big deal. Dogs are easy to avoid’. So yes, most of the time I could avoid them. Although socially it was restricting. If I was invited, let’s say for a walk over the Downs to a country pub for lunch. I could only accept the invite if I was going to be with someone who was aware of my fear, appreciated and understood how paralysing it was for me and they were prepared to defend me to the death in a chance encounter with a dog. If such a person wasn’t totally with me in every respect, I couldn’t go. I couldn’t walk along the seafront because often, despite the rules to the contrary, there would be dogs off the lead. If I was invited to a party at someone’s house or round for dinner, my first question would be whether they had a dog. If the answer was yes then unless they were prepared to shut the dog away for the evening, I couldn’t go. Not being a dog owner at the time I didn’t realise what an unreasonable request it was to shut the dog away for the evening! Now having my own bundle of fur as the light of my life, I can see that it was. So yes I’ve overcome my fear of dogs. So what is it you’re afraid of? A classic one can be a fear of flying. We can have lots of fears that are called ‘irrational’. I don’t really like calling them that. It makes them sound trivial. I know from experience that at the time they don’t feel trivial or irrantional. That fear of dogs was real. That fear of flying feels real and justified. It can bring on sweats, palpitations, nausea, maybe reduce you to tears. And that isn’t only mid-air, if you can get as far as getting on a plane, it may start the minute that someone mentions the word ‘holiday’ which may be months before the actual event. Maybe you’re afraid of crowds. Again it may not only be when you’re in a crowd that it affects you but the mere thought of being in a crowd. It may start the minute someone mentions that party. And as a result of this fear, as I missed out on walks and social events for years you ,may be missing out on great things too. Your sister/ cousin / son is graduating from university. How exciting! Let’s throw a party! You have to miss out. You may pretend that you will go or indeed have the full intention of going, but come the day you call them up to say that you’re not feeling well so can’t make it. That may be an excuse because you can’t face the crowds or it may be that you genuinely feel rough. And that feeling physically ill can easily have been generated by your fear of the crowds that you anticipate encountering. A big family holiday is organised. Everyone is going! Your sister announces “My boss has a villa in Portugal that we can use for free!” Yippee! Your fear of flying either means that you have to miss out, or to accommodate you, everyone has to go to Bognor for the week instead. So these fears have wide reaching negative effects on us. On our happiness, our health and our lives. How much longer do you want to live with this? I overcame my fear of dogs and I don’t believe that it was anything to do with ever having been attacked or frightened by a dog. In unravelling the fear, its base was something completely unrelated to dogs. It is possible to overcome your fear, whatever it is. And I understand that your fear is real. I also understand that at this point in time it can feel an impossible task to get rid of it as you’ve had it for so long. But I also understand, or know, that you can get rid of it. Do you know where yours has come from? Do you know what started it and when? If you do then give some thought to that. Ask yourself whether it’s necessary to still hold onto the fear. That may be your first step in overcoming it. It may not be a five minute job but it will be a start. So I wish you all the best in resolving the issue. If you’d like some help then I’d love to have a chat with you about it. And rest assured that my methods are not the immersive type. I don’t believe in throwing yourself at the fear until you feel ready so there’s nothing to worry about in that respect. I won’t demonstrate that further by giving an example of immersing you in the thing that you’re afraid of. I appreciate that even me saying it will create all that crushing and overwhelming feeling of fear and anxiety that have been holding you back in life until now. So, let’s change the future and get rid of this fear! Let’s enable you to go waking over the downs, go to that graduation or take that family holiday. I look forward to hearing from you when we can talk about what’s going on for you and how I might help. Previous PostGet what you want in lifeNext PostCan you save the planet with a piece of paper?